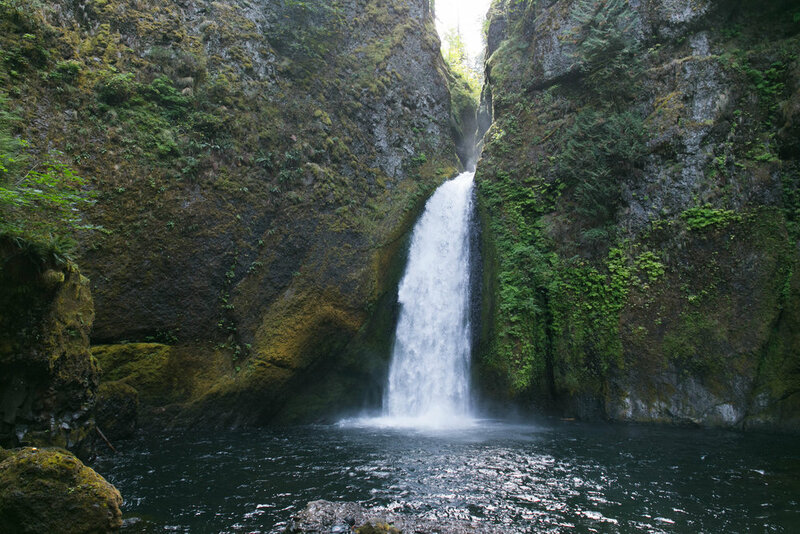 How to get there: Wahclella Falls is only 10 mins from Oneonta Gorge. Get back on I-84 E, and take exit 40, and a right to Yeon State Park. Wahclella Falls is another quick, relatively easy-moderate, with some elevation hike for all levels. Parking can be a bit challenging since there are only 12 spots, but there is an overflow parking area that is a bit of a distance from the trailhead or on the side of the road. About 3/4 mi into the hike you reach a fork. It is a loop so you can either take the upper trail (left) or lower trail (right). The upper trails takes you to a point with a higher view of the falls and the lower trail that takes you to the ground view of the falls. Both essentially end up in the same place since the higher point and ground point are in the same spot but just a little bit of climbing between the two. Standing at some angles you can see the top-tier of the falls, but the main falls is the towering lower tier. You can even swim to the falls from the rocky area. We had lunch at the higher point overlooking the falls and hiked back from there, taking the higher-trail back to the parking lot. Couple getting married in front of the falls. HOW TO GET THERE: Fairy Falls shares a parking lot with Multnomah Falls. Take I-84 E from Portland and take exit 35 to Historic Columbia River Highway. Just 2.5 miles past Lower Oneonta Falls trailhead. The Wahkeena Falls trailhead shares a parking lot with Multnomah Falls, make it a larger but also very crowded area. Just wait for someone to leave, or park farther down the road. The trailhead starts to the right across a wooden bridge that goes over Wahkeena Creek, if you go to the left instead it takes you to Multnomah Falls. There is a long switchback with moderate incline to a bridge at the base of Wahkeena Falls, where many turn around. But from there you keep going and the trail becomes steeper. You walk up 10 or 12 switchbacks before the paved road turns into dirt. Here you have reached Wahkeena Canyon. The trail is narrow and continuously uphill but runs along the creek which was a nice view during the hike. The trail continues to switch back a few times before you reach a pretty site of Fairy Falls, where there is a bench to rest. Because of the uphill climb and our race against time we hiked at a faster pace and I was pretty tired and out of breath by the team we reached the falls. By no means is the trail very difficult but it is an uphill hike! The trail continues on, but we turned back from here. Check out my favorite waterfall we visited: Abiqua and Butte Creek Falls! Or a hike through water to get to a hidden waterfall at Oneonta Gorge.